2. Photoluminescence revealed tiny, bristle-like rods of copper oxide (top right) in the amulet's interior. 3. The archaeological site MR2 at Mehrgarh, where the amulet was found. 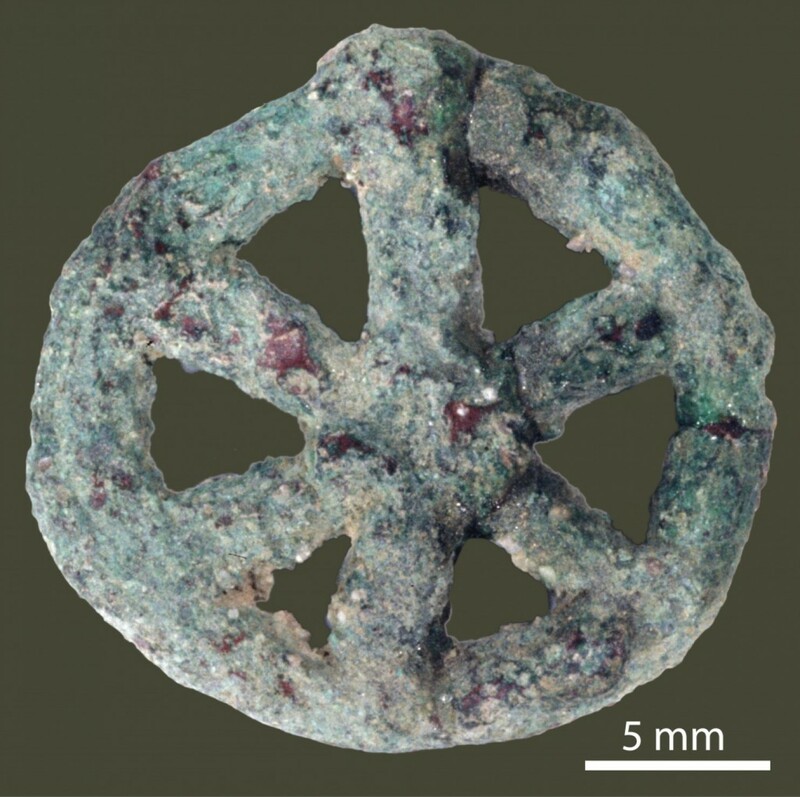 One of the most exciting discoveries of the year: a detailed, full-field photoluminescence study of a 6,000 year old copper "wheel" amulet from Mehrgarh in Balochistan has opened the door to many new facts about this period of history. This study by Ipanema, the European center for the study of ancient materials, believes that this is the oldest known example of the "lost wax" casting technique, one of the most important innovations in the history of metallurgy. In this method of metal casting, a mold is made with wax, then covered in clay and baked until the wax melts out and the clay forms a hard mold. Then molten metal is poured into this cavity and cooled until it hardens. When the mold is broken open, a perfect metal model of the original wax structure remains. In this example from Mehrgarh, the form is also one of the oldest known ancient Indus signs, possibly of a wheel, but certainly of a six-spoked circular object. Over the millennia, lost-wax casting has been used to produce innumerable artefacts, including daily use items like knives, water vessels, utensils, tools, as well as high-value and symbolic items such as jewellery, religious figurines, and metal statues of gods, kings and heroes.The article states that "The technique helped societies transition from the Stone Age to the ages of copper and bronze and gave rise to new and powerful types of culture." Over thousands of years we find many excellent examples of this method of casting in different metals from different parts of the world, such as the bronze Buddha at Tōdai-ji temple in Japan, the Benin Bronzes from West Africa, the Dhokra metal ware from Orissa, the Chola Brones and Faberge eggs from Russia. Within the Harappan Phase of the Indus Valley Civilization, the Dancing Girl of Mohenjodaro is probably the most famous example of lost wax metal casting. 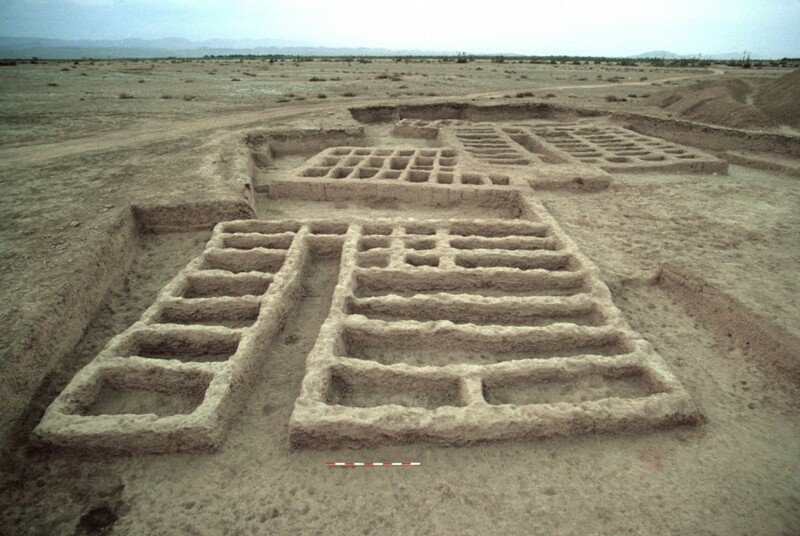 In linking the development of technological innovations between Mehrgarh and the mature Harappan phase, a different article on the metal technologies of the Indus Valley, Jonathon Kenoyer writes that "the evidence from Mehrgarh and other early sites demonstrates that the pyrotechnological and metallurgical innovations of the Neolithic and Chalcolithic set the technological background for the metallurgical traditions of the Harappan Phase….the origin and development of copper metal technology occurred in conjunction with developments in other technologies. "This example of attempting to work with pure copper, a metal that is hard to acquire and corrodes more easily than an alloy, demonstrates that the people of Mehrgarh were innovating with new substances and technologies. "In terms of beauty or sophistication, the amulet cannot rival its more famous successors. But [Mathieu] Thoury [the lead investigator] finds it impressive in other ways. Not only did the amulet's creators use a new casting technique, they also opted to craft the amulet entirely from copper — a rare and unusual choice, since pure copper is hard to acquire and corrodes more easily than an alloy. 'It is not the most beautiful object, but still it holds so much history,” he said. “It shows how the metalworkers at the time were so innovative and wanted to optimize and improve the technique.'" More at This 6,000-year-old amulet is the oldest example of a technology still used by NASA. A large version of the video The Mystery of the Amulet is also available. 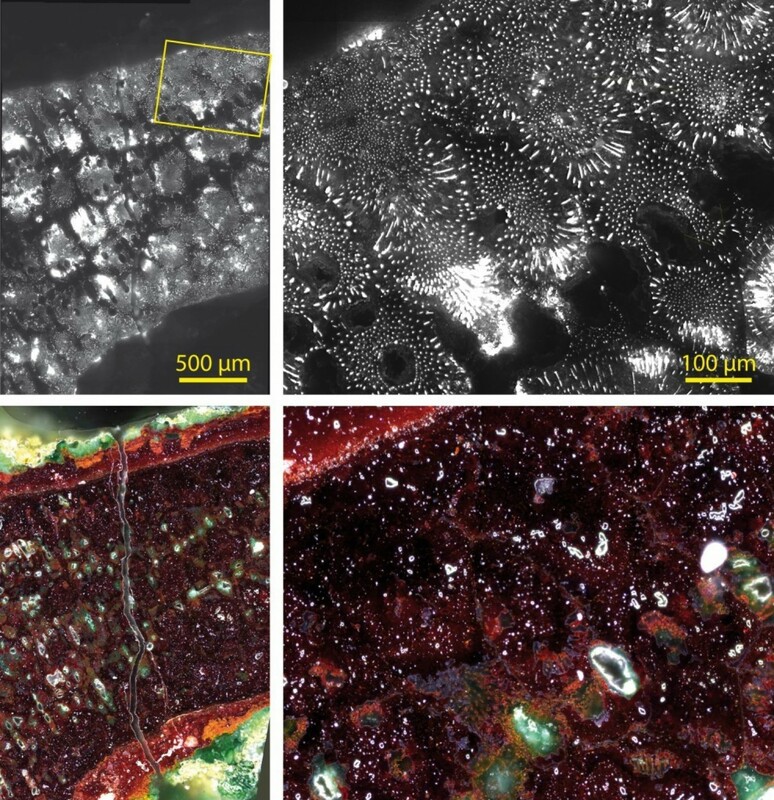 The article High spatial dynamics-photoluminescence imaging reveals the metallurgy of the earliest lost-wax cast object discusses the technical aspects of this discovery.